A fluffy fleece lined foot pocket pad that cushions your foot against the fin while doubling the range of Force Fin sizes that fit your foot. When fins are worn barefoot, the Comfort Instep will conform to unique foot contours, cushoning pressure points, and eliminating abrasion. 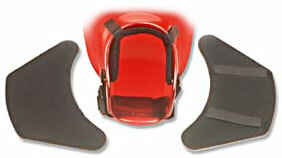 When fins are worn with booties, remove the Comfort Insteps to accomodate for the increase of you foot width. A fluffy fleece lined foot pocket pad that cushions your foot against the fin while doubling the range of Force Fin sizes that fit your foot. Comfort Insteps conform to unique foot contours, cushioning pressure points and eliminating abrasion. Comfort Insteps are 3/8" thick so your Force Fins must be sized up one from your barefoot shoe size.